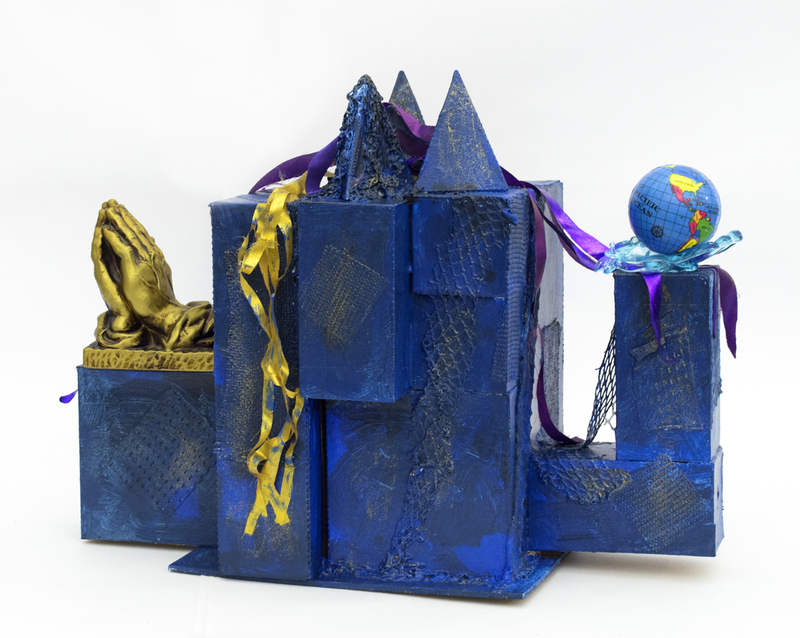 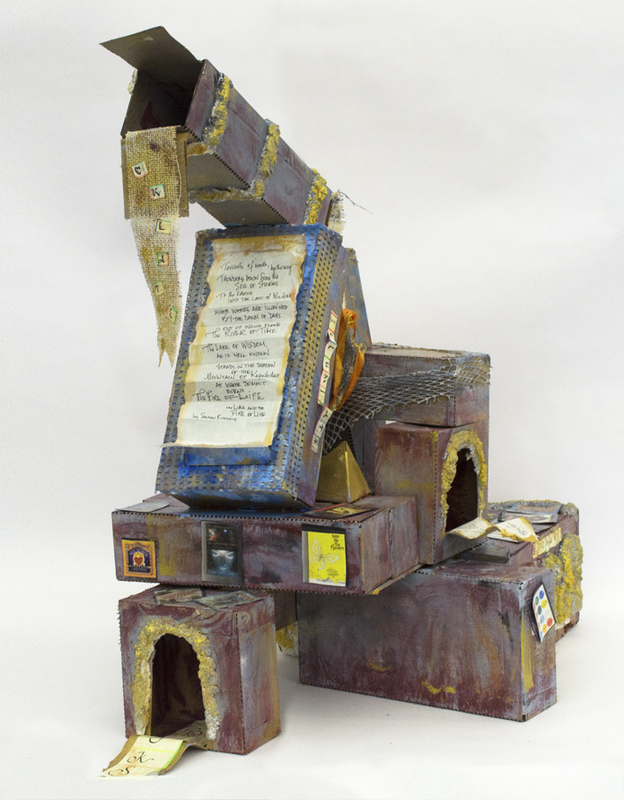 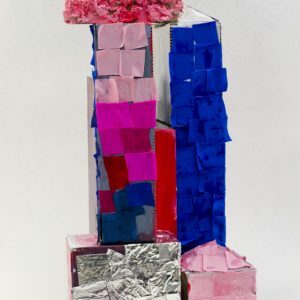 This project invites participants to explore the pedestal as both a place to display a special object and as a sculptural form unto itself. 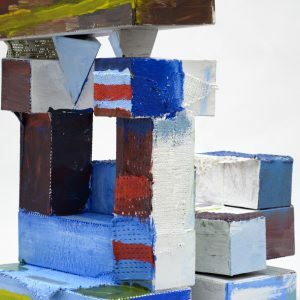 Drawing from still life and pedestal traditions as well as recent and modern sculptural references, In-the-Round uses formal abstraction as an entry point into layered, personal creative process and story-making. 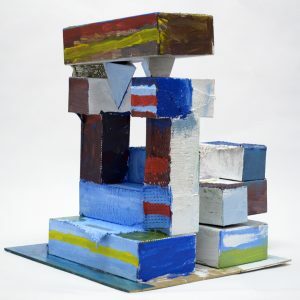 As its title suggests, participants are asked to consider their sculptural pedestals In-the-Round, that is from many perspectives both literally and figuratively. 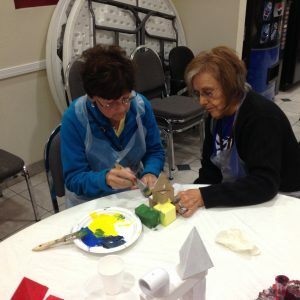 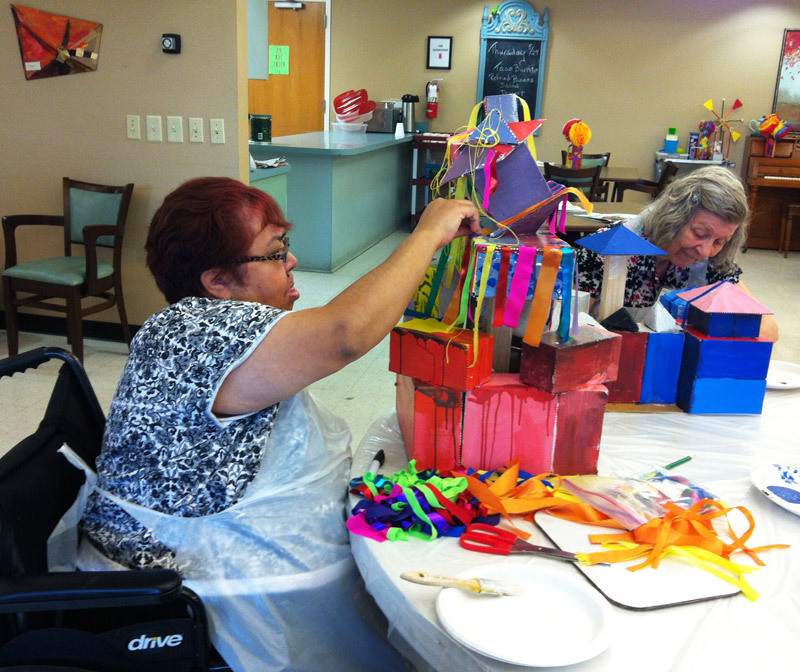 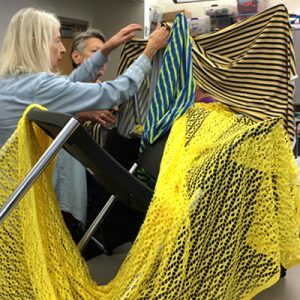 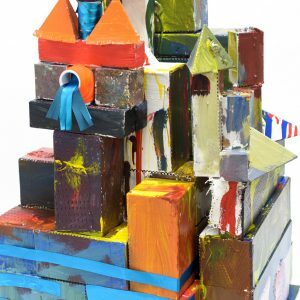 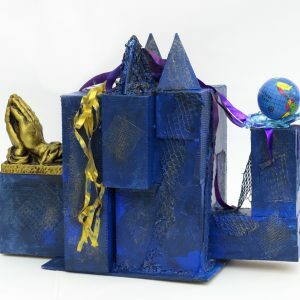 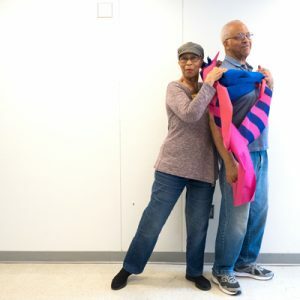 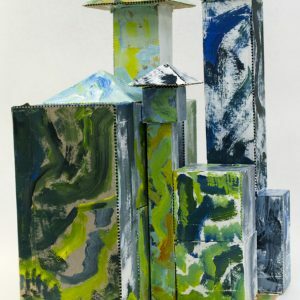 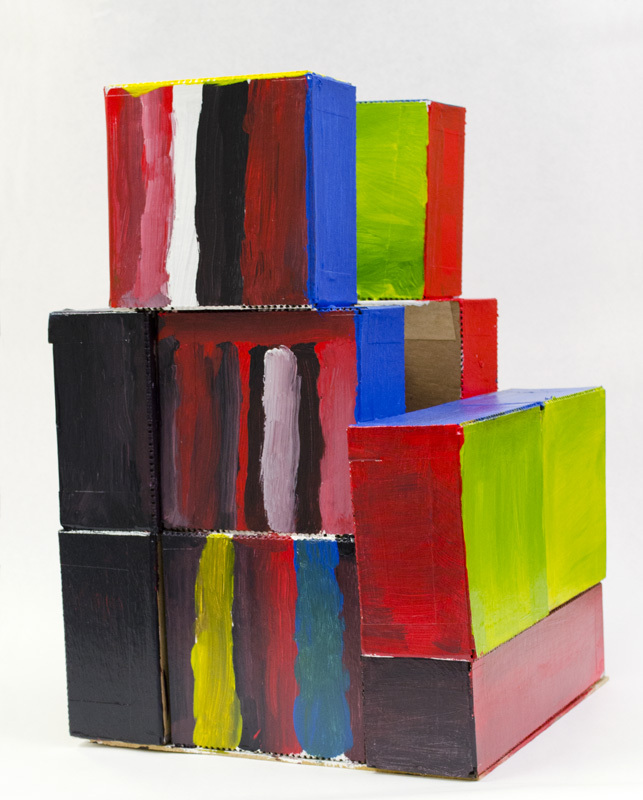 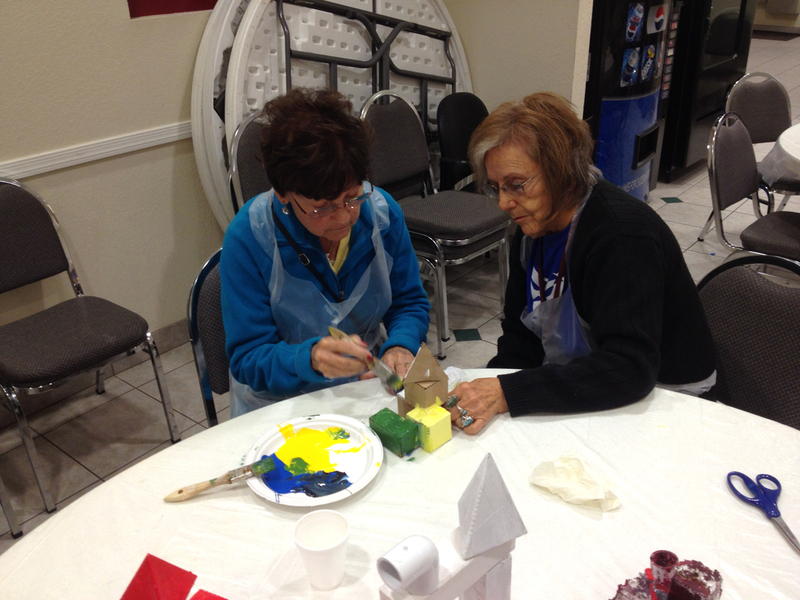 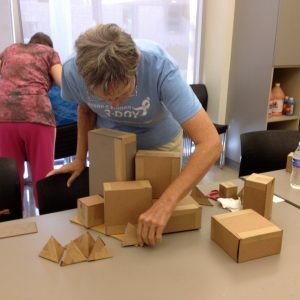 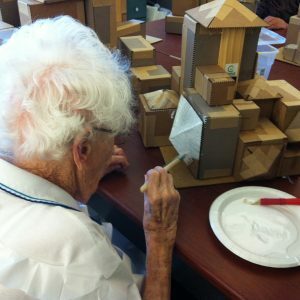 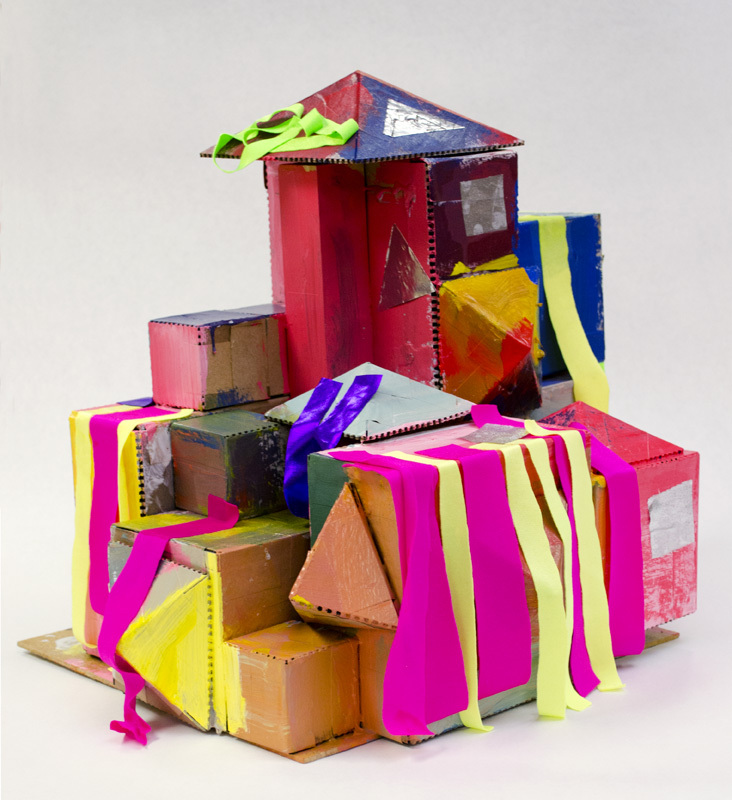 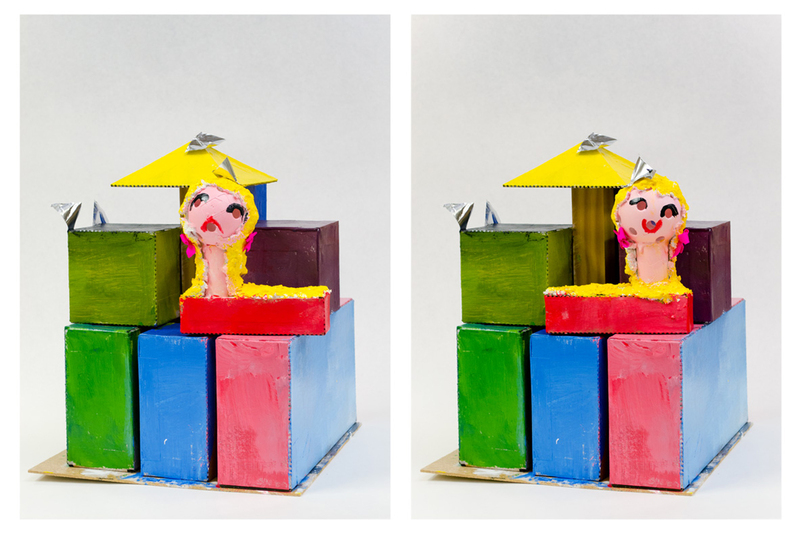 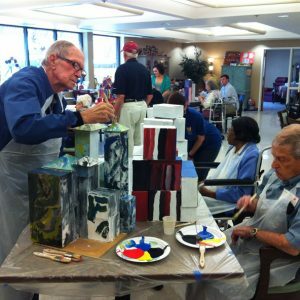 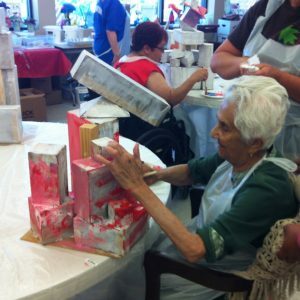 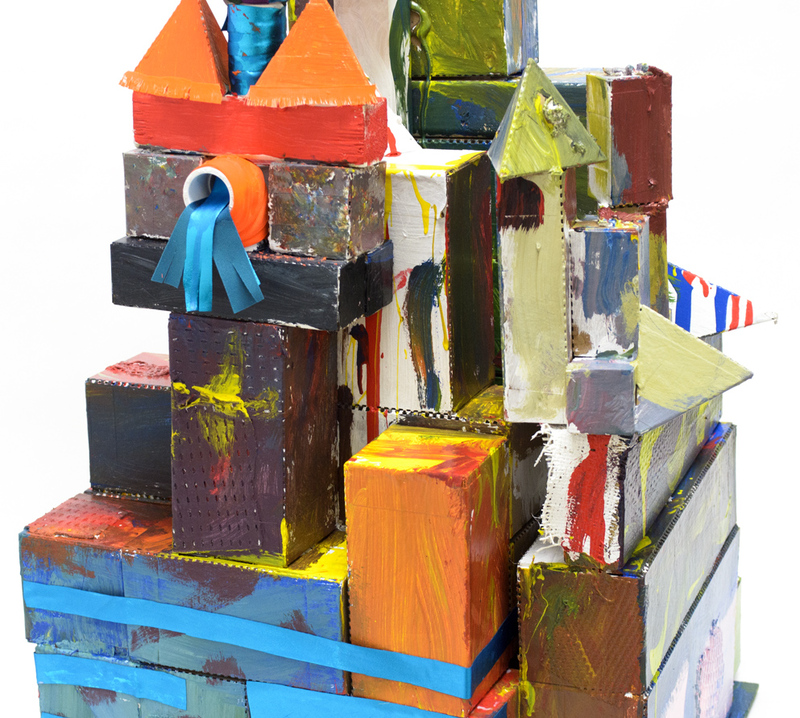 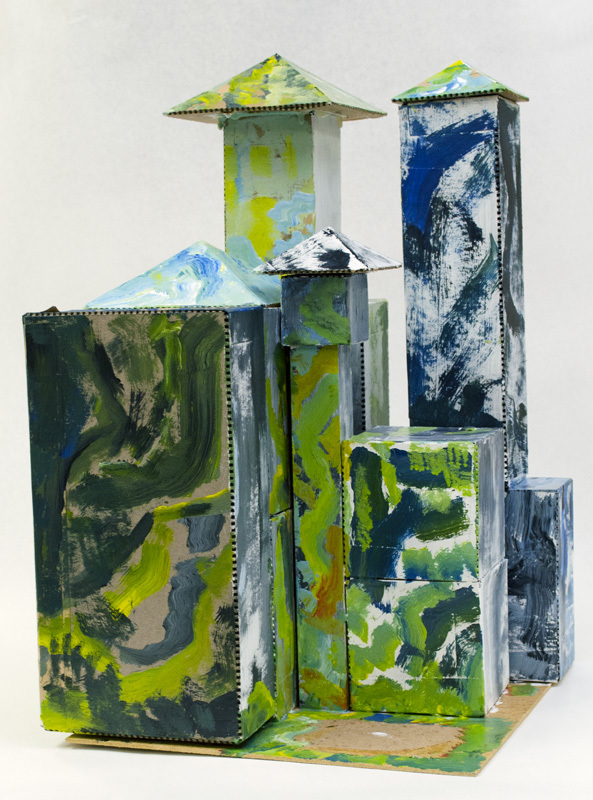 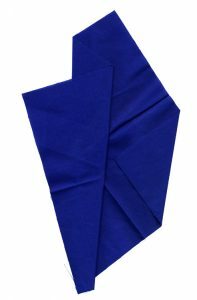 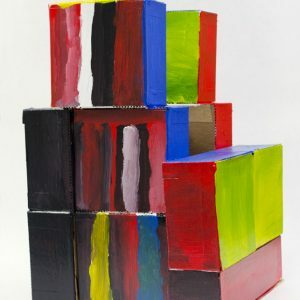 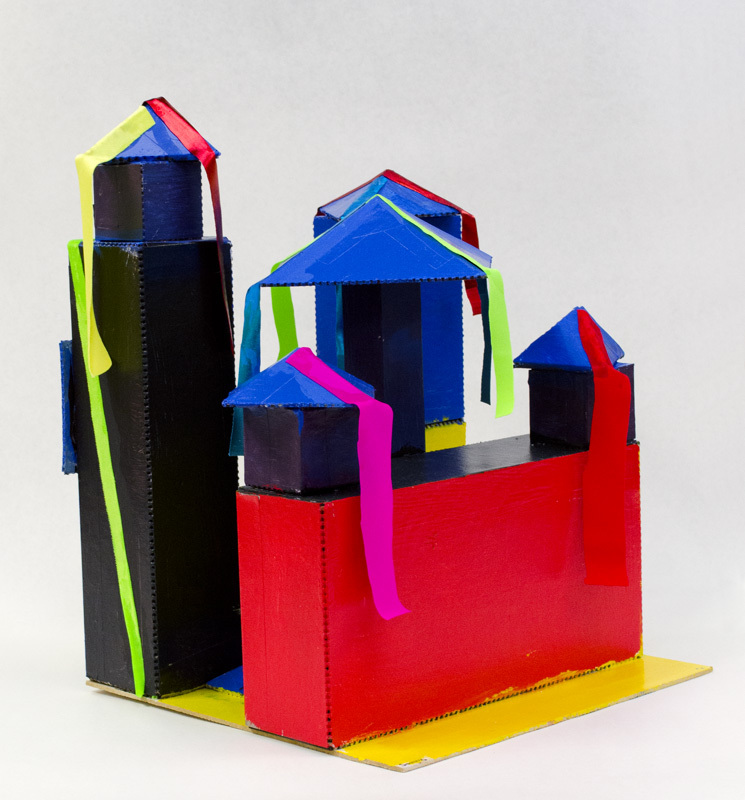 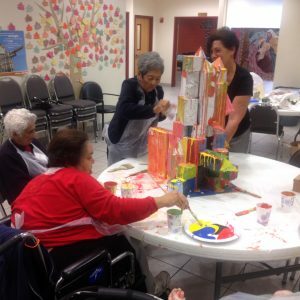 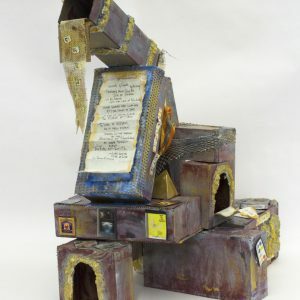 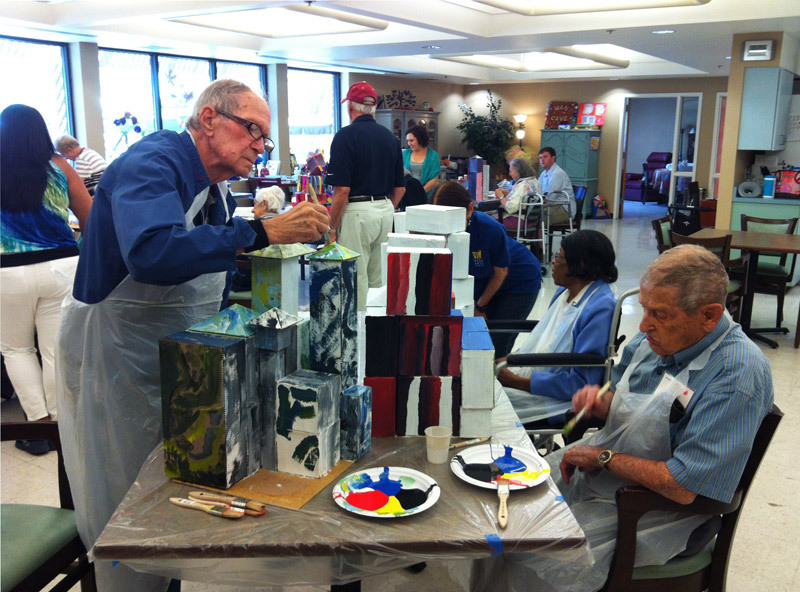 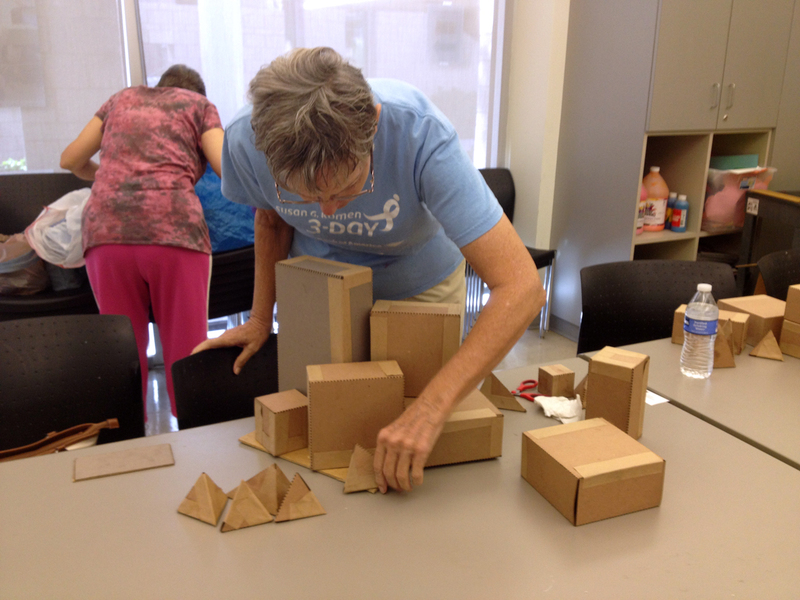 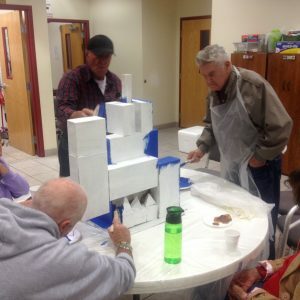 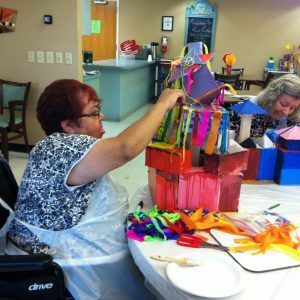 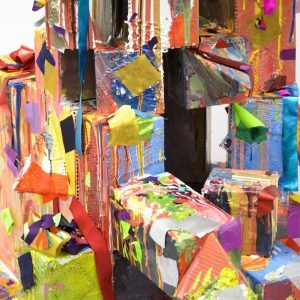 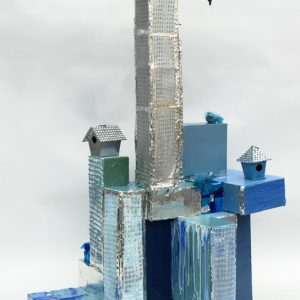 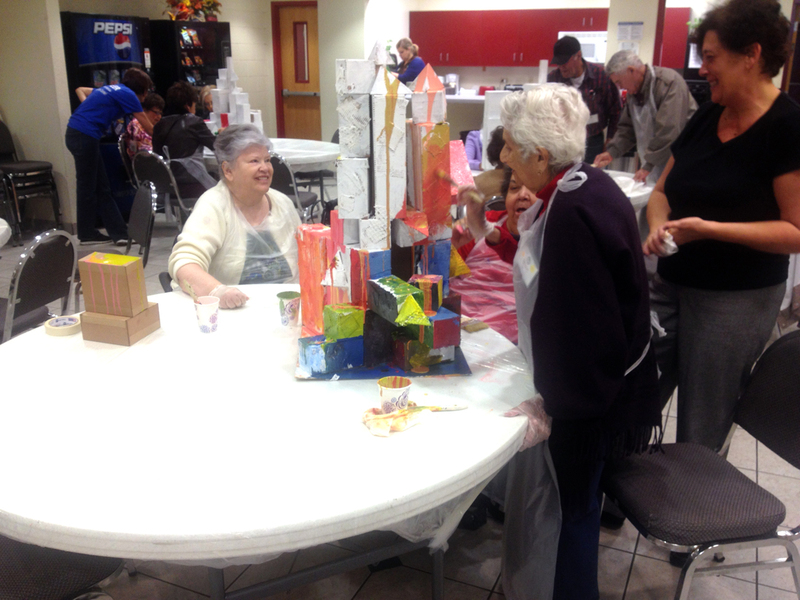 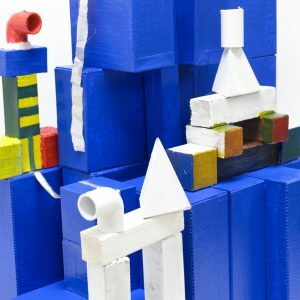 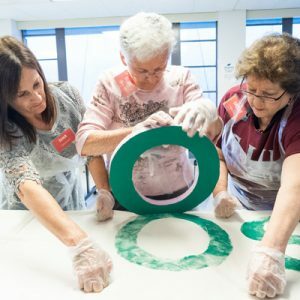 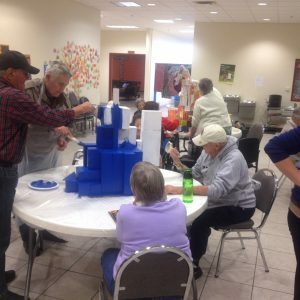 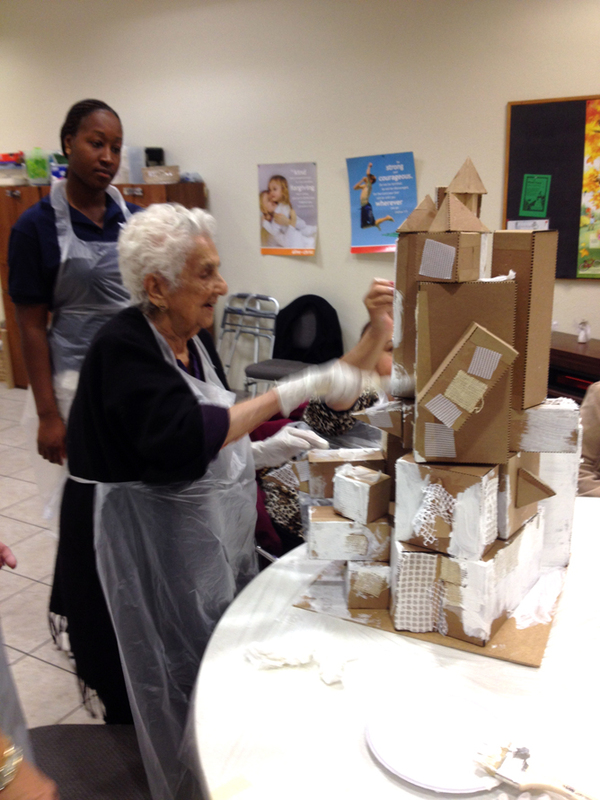 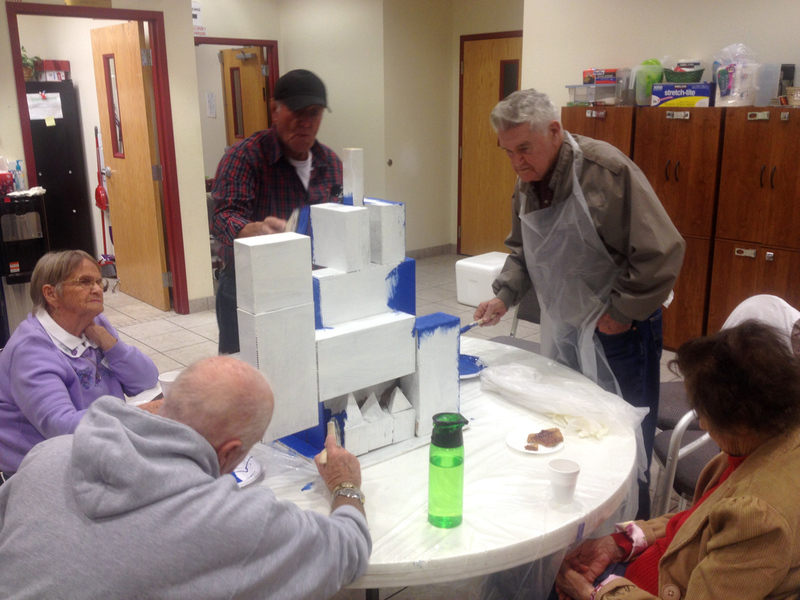 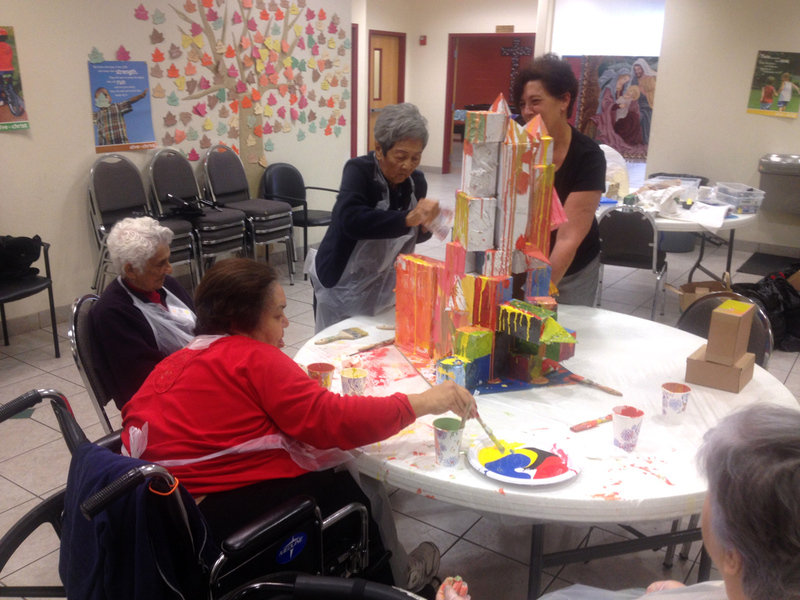 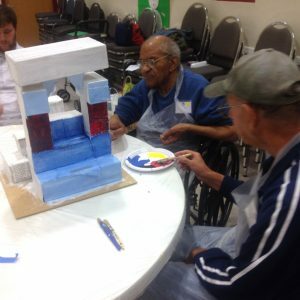 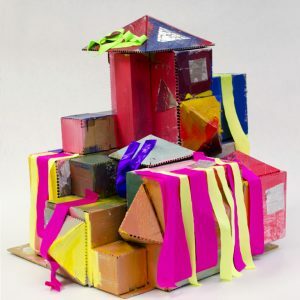 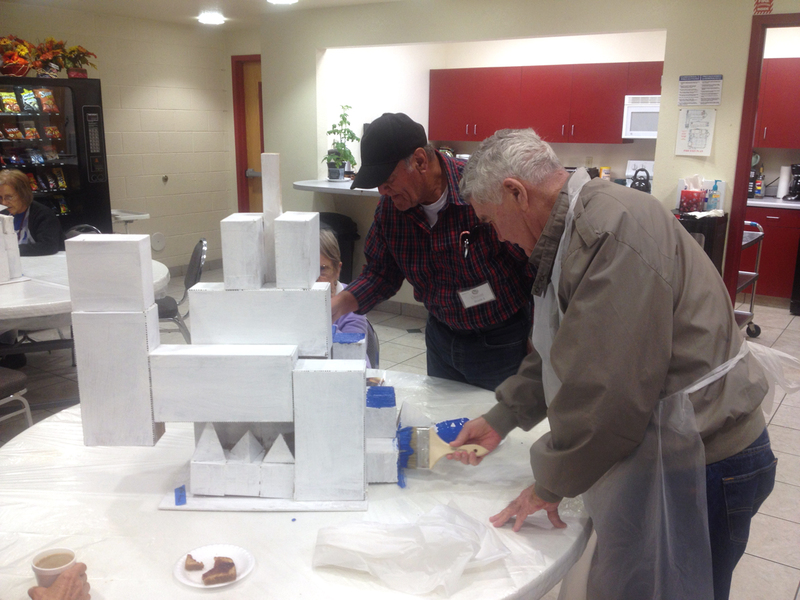 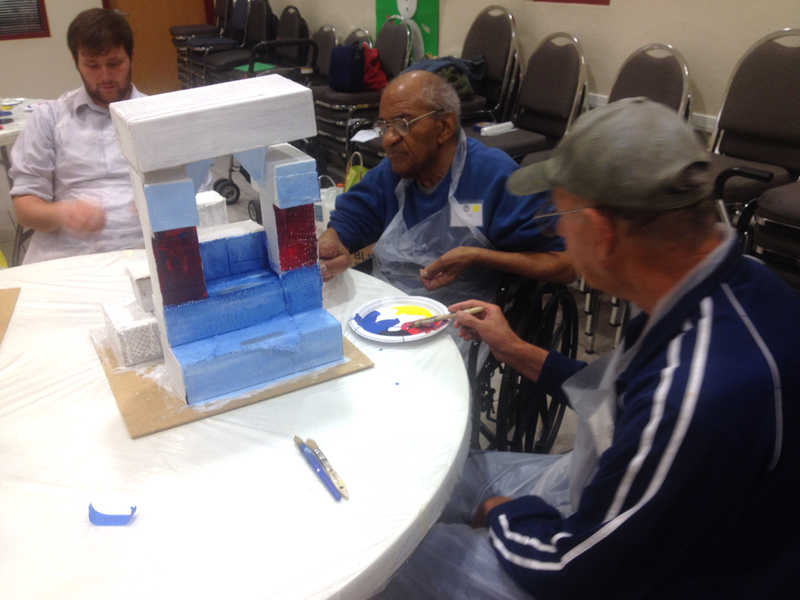 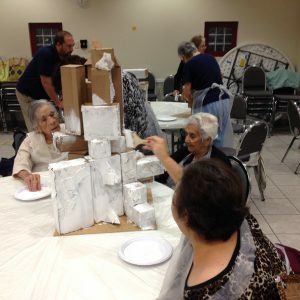 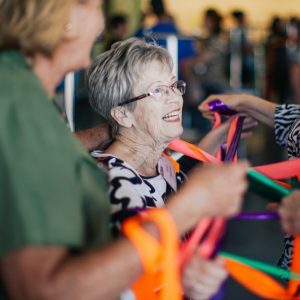 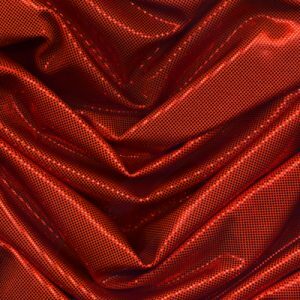 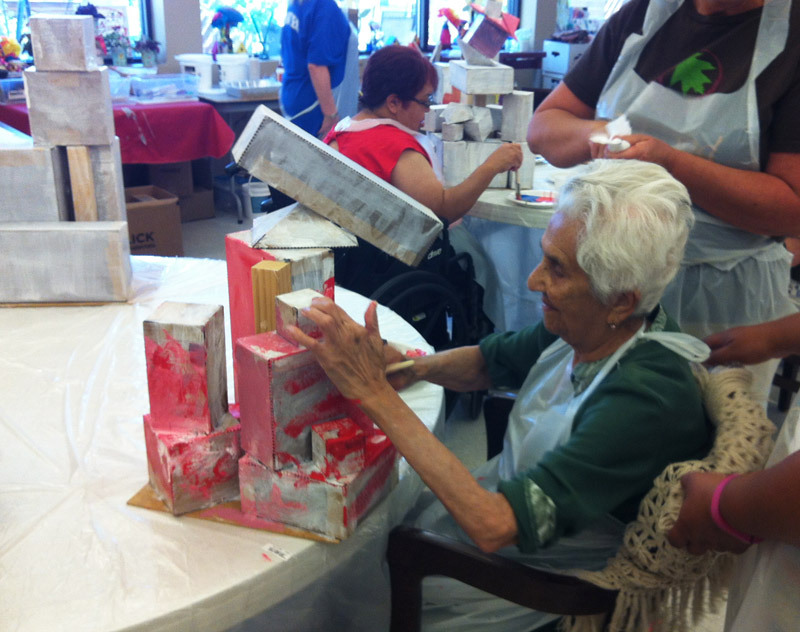 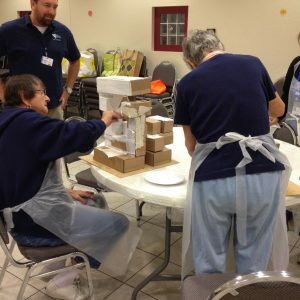 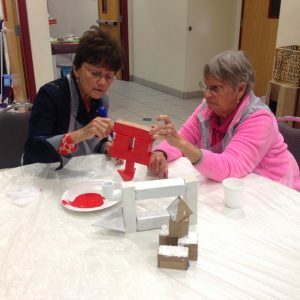 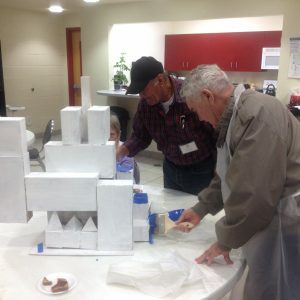 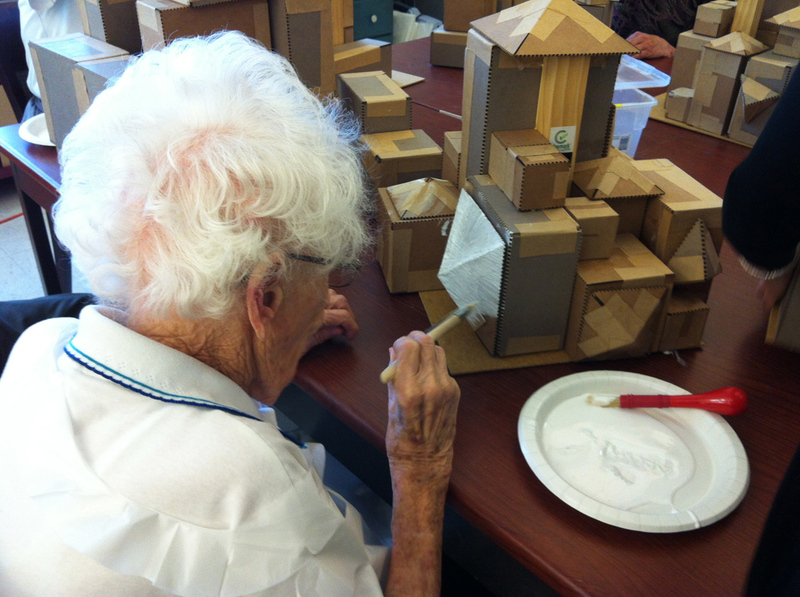 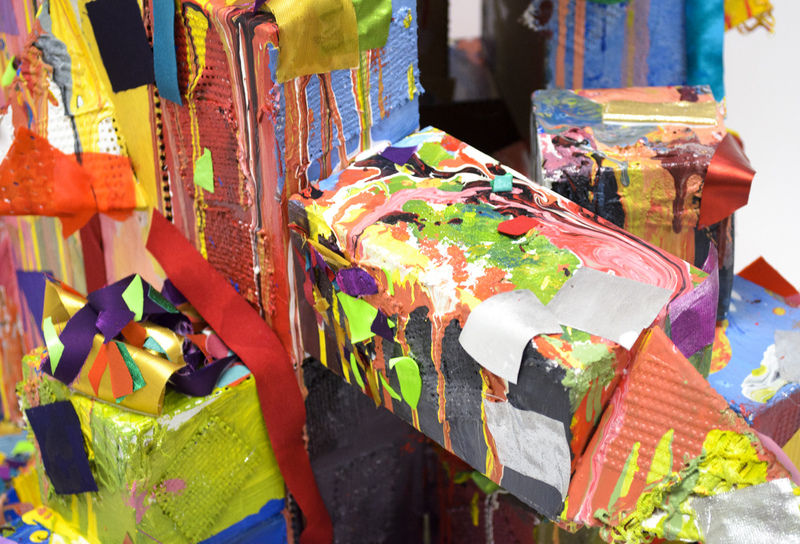 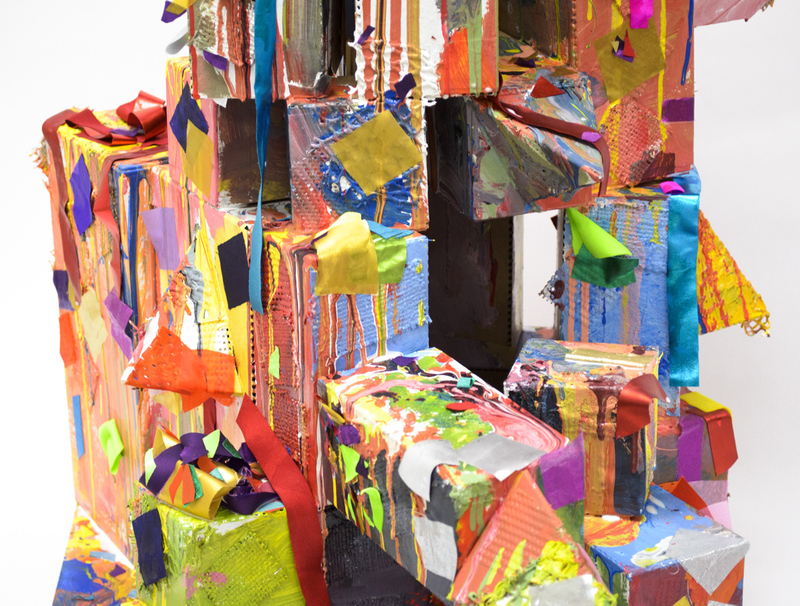 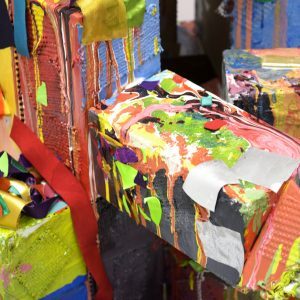 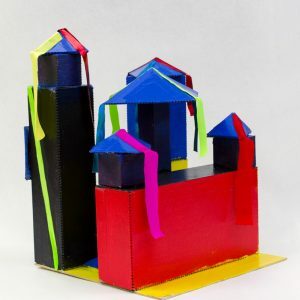 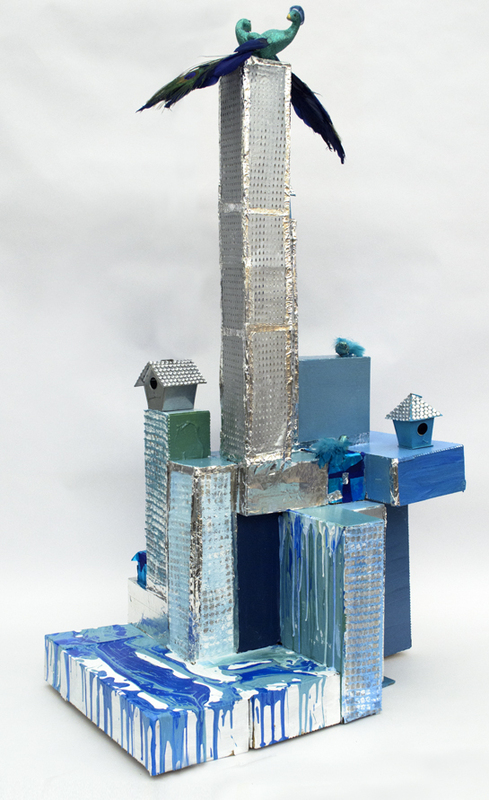 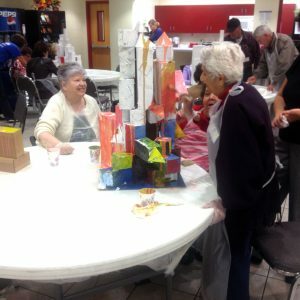 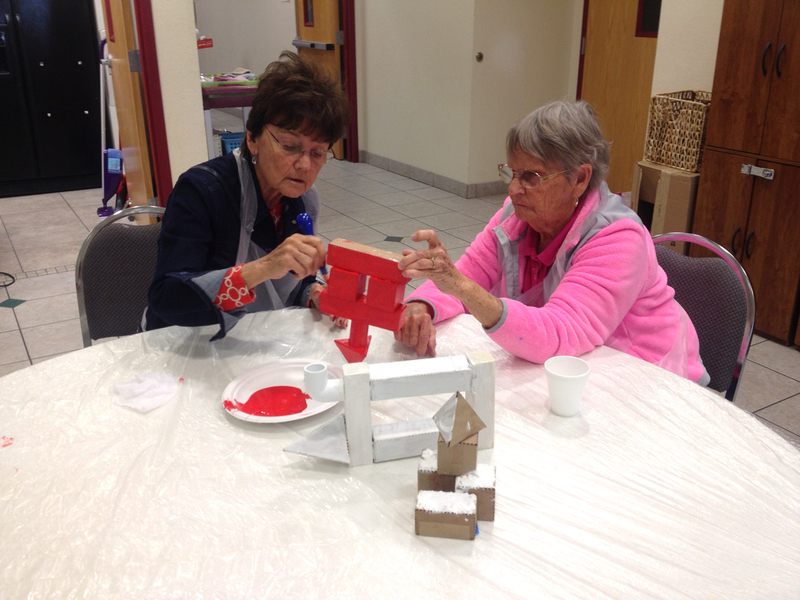 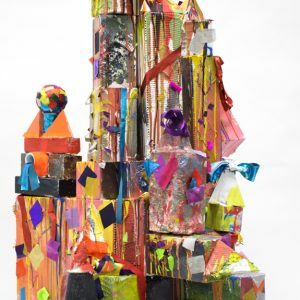 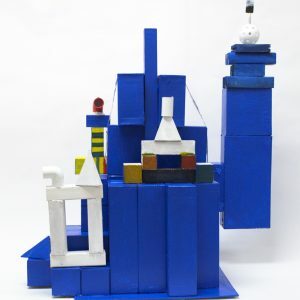 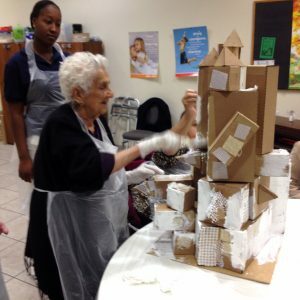 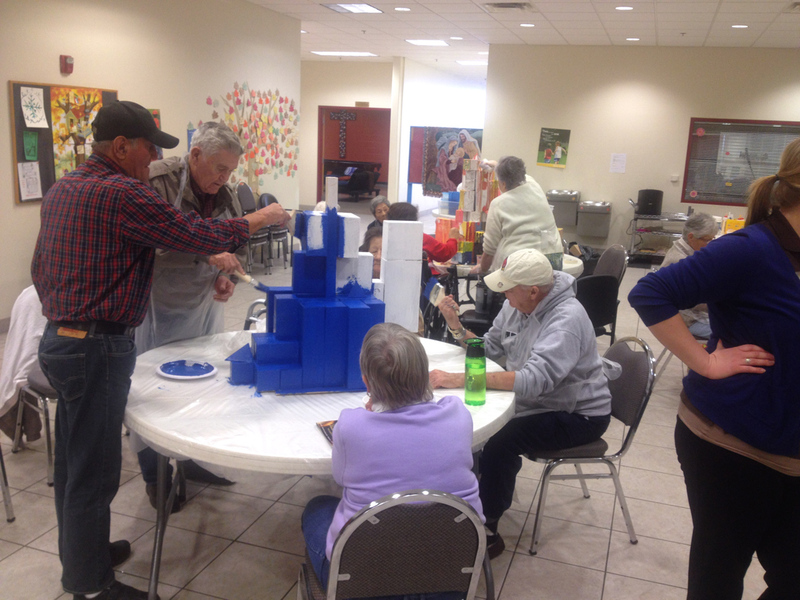 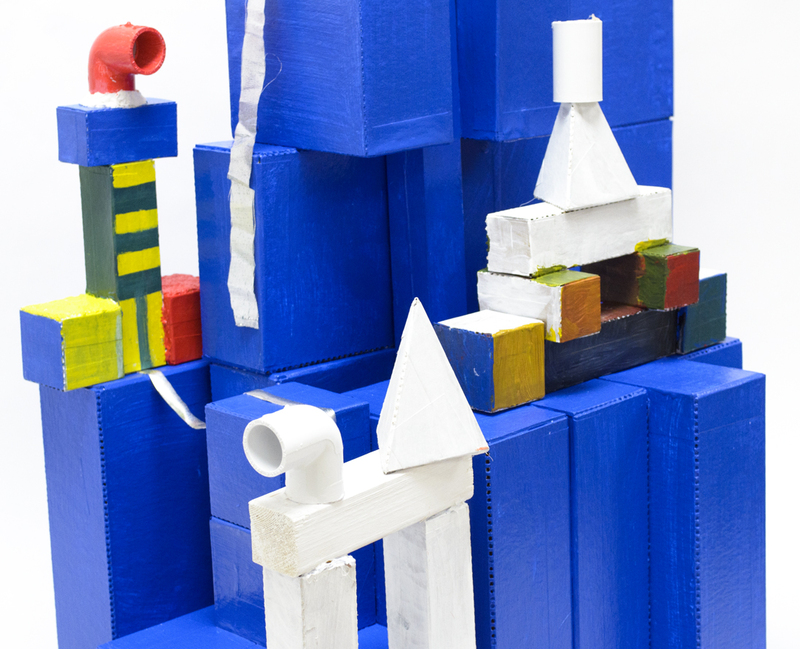 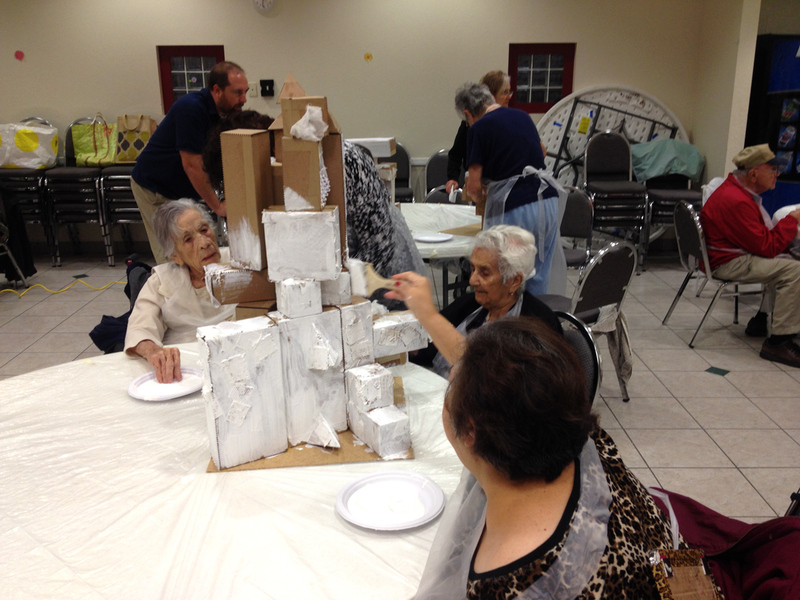 Participating older adults begin this project by using geometric blocks as a sculptural building material to create the form on which they proceed to build up layers of paint, thread and fabrics. 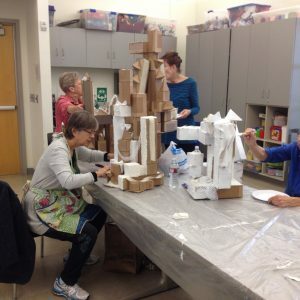 The project takes three approaches to this inquiry. 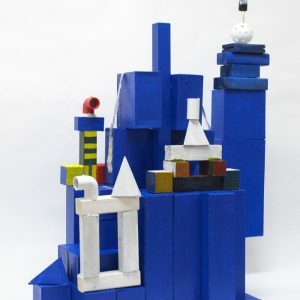 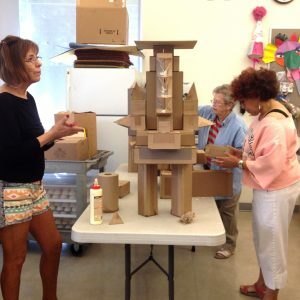 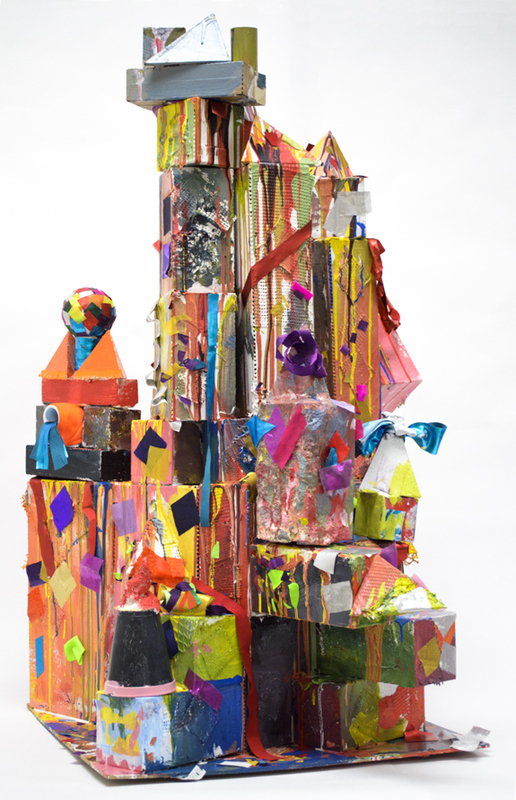 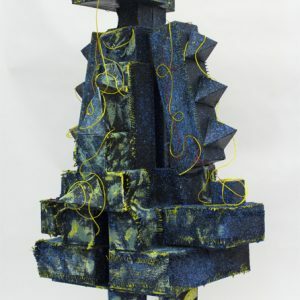 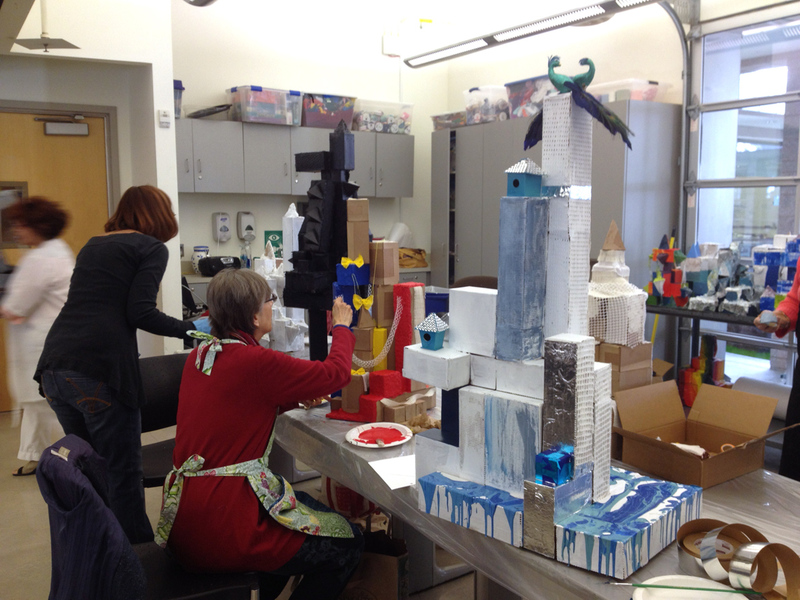 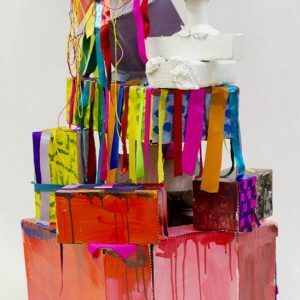 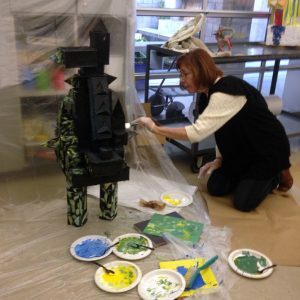 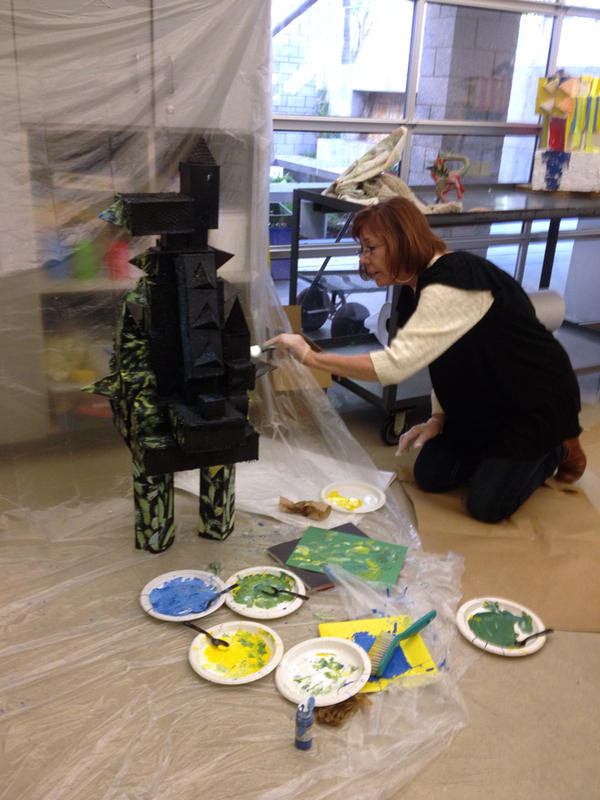 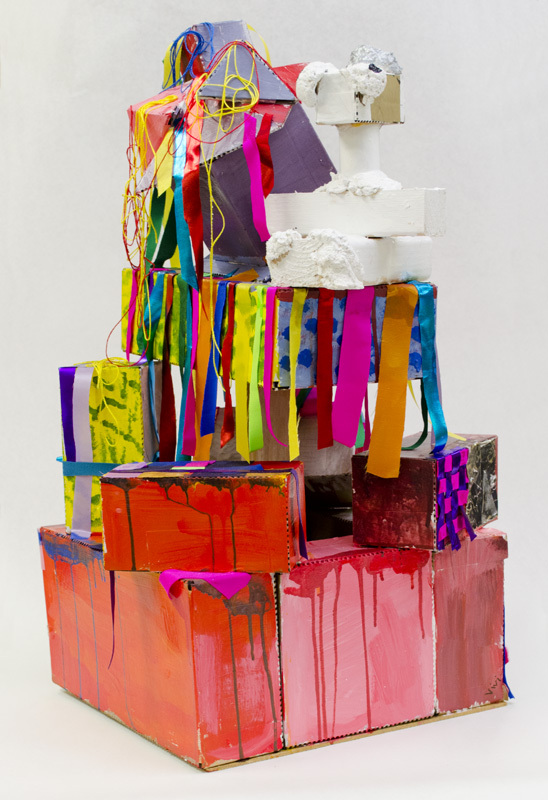 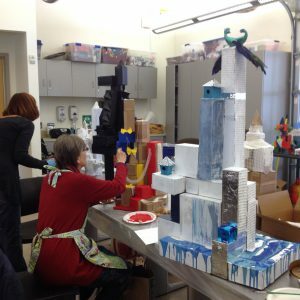 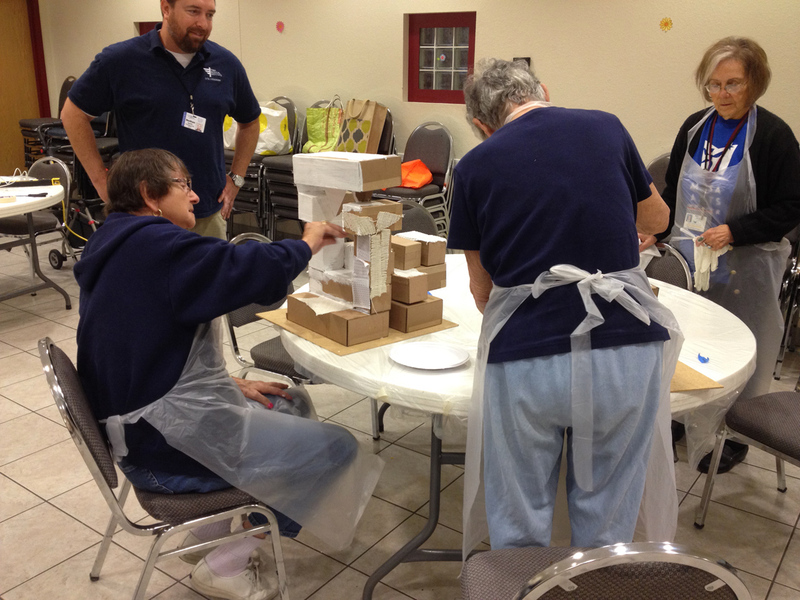 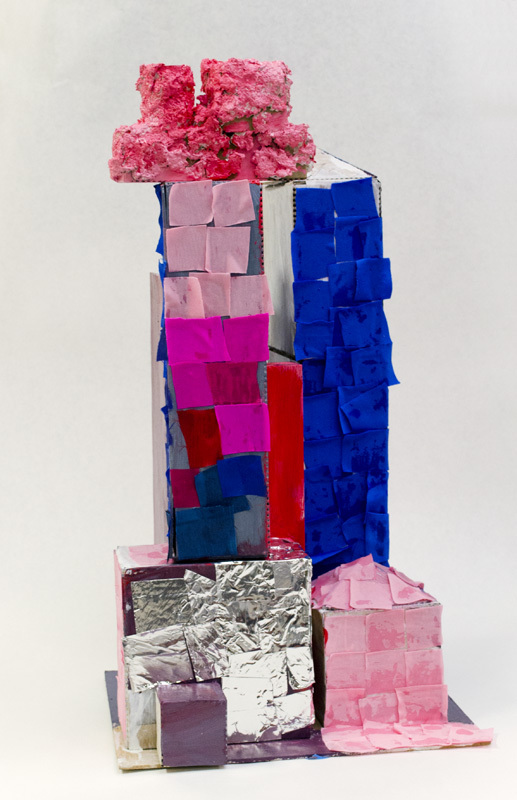 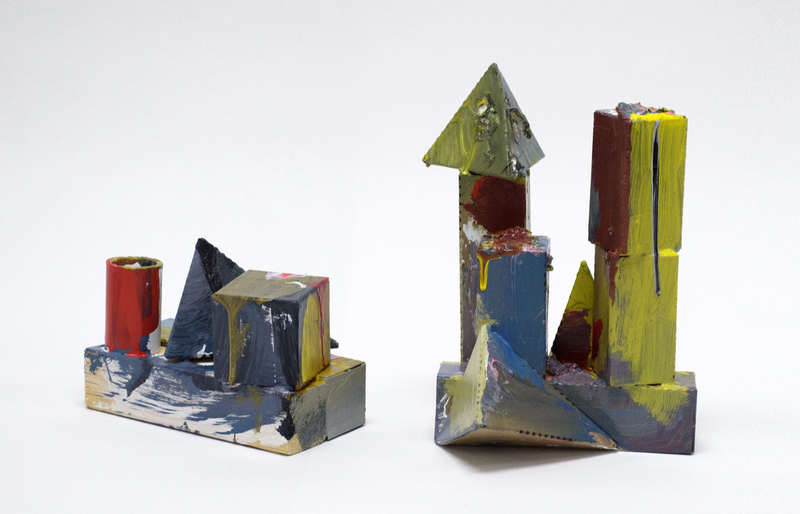 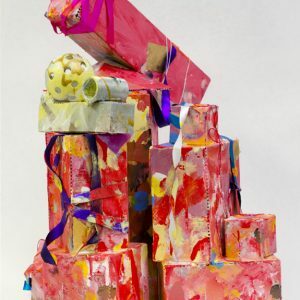 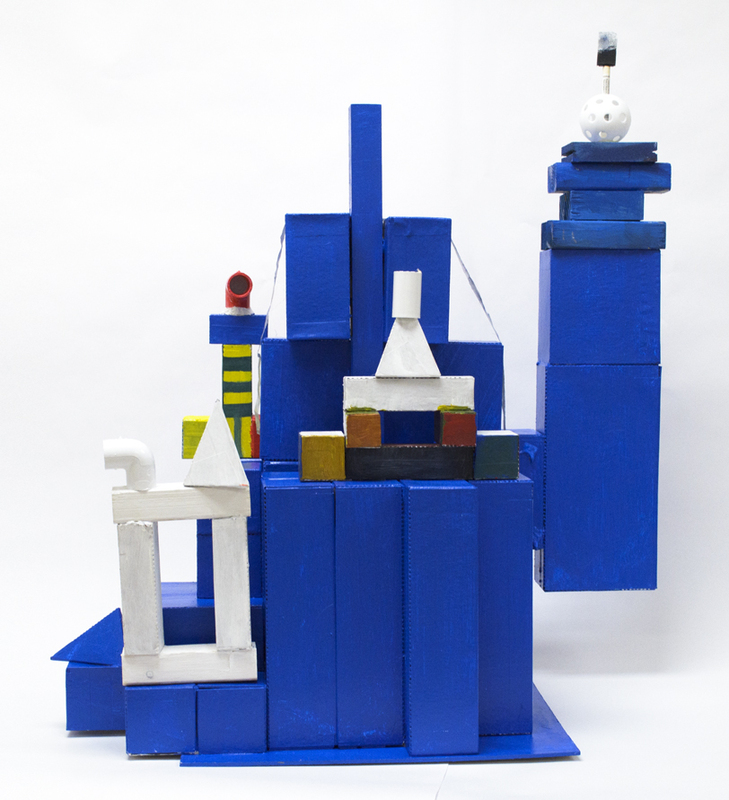 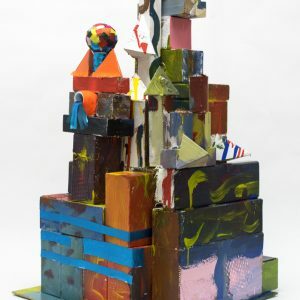 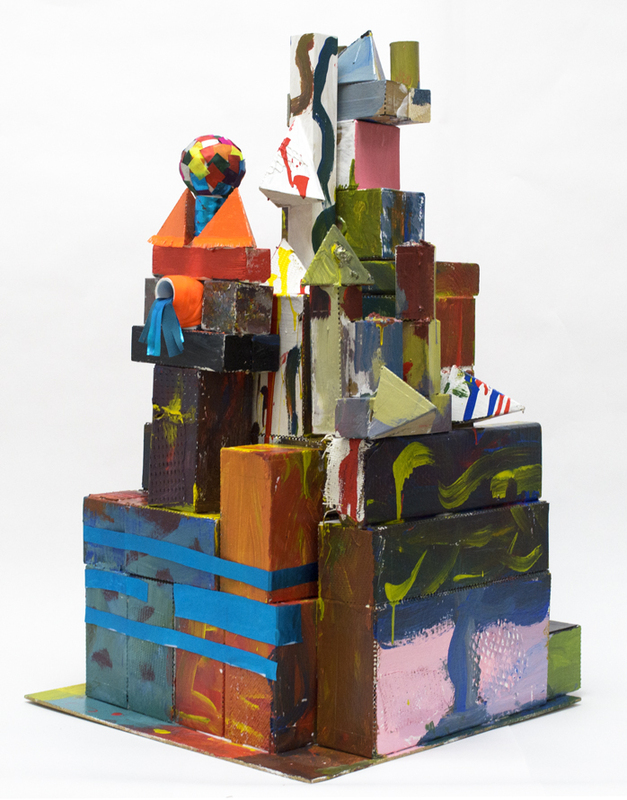 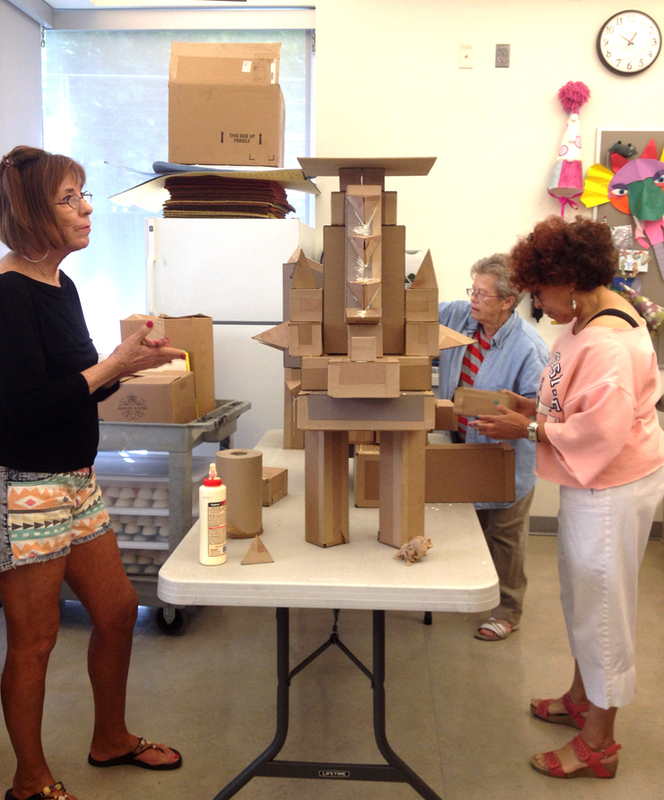 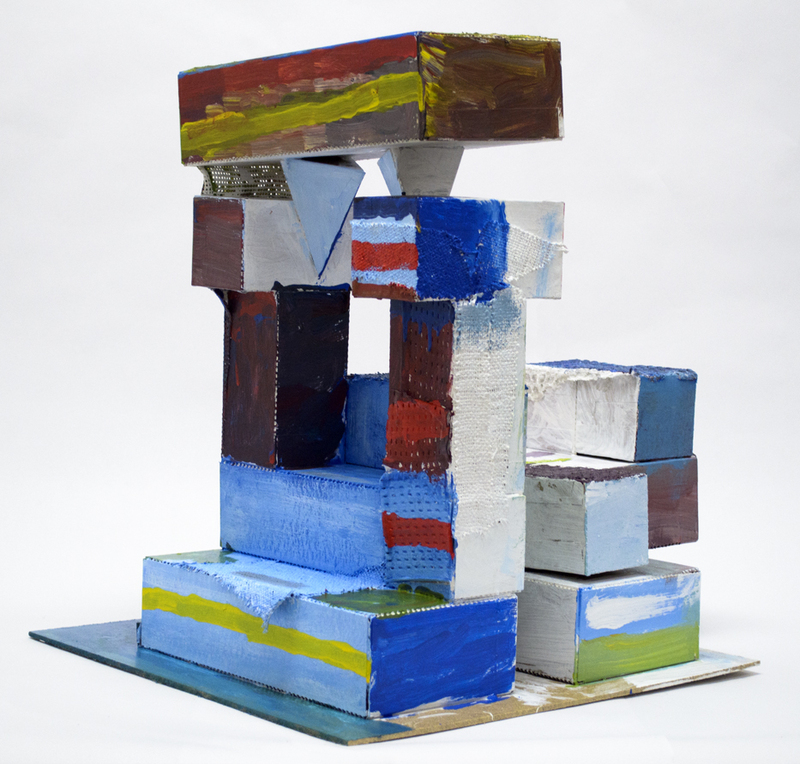 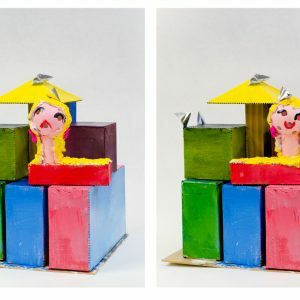 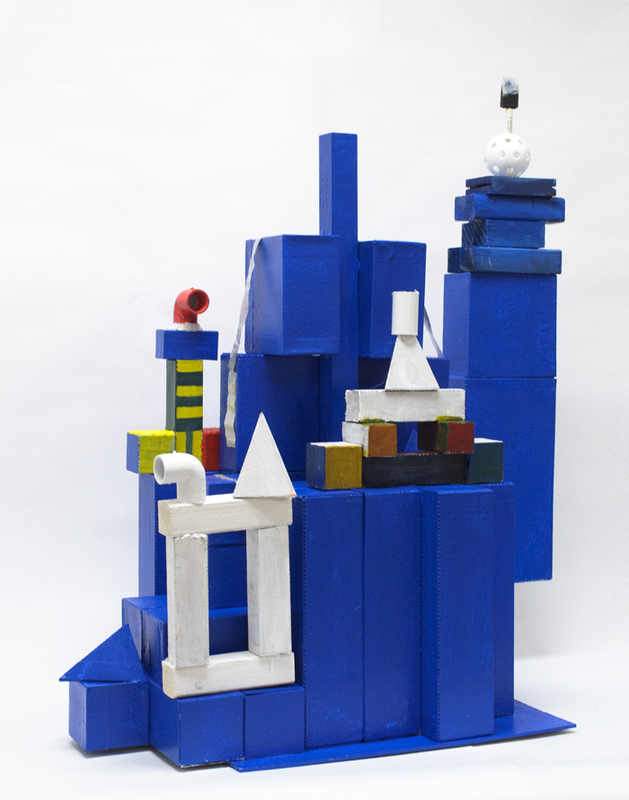 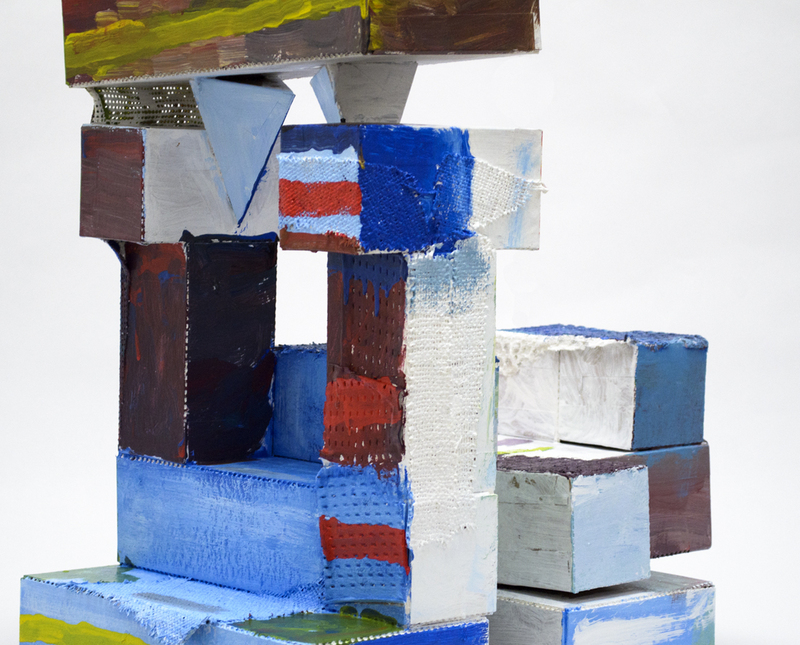 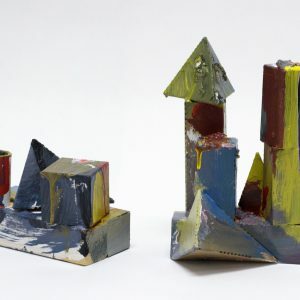 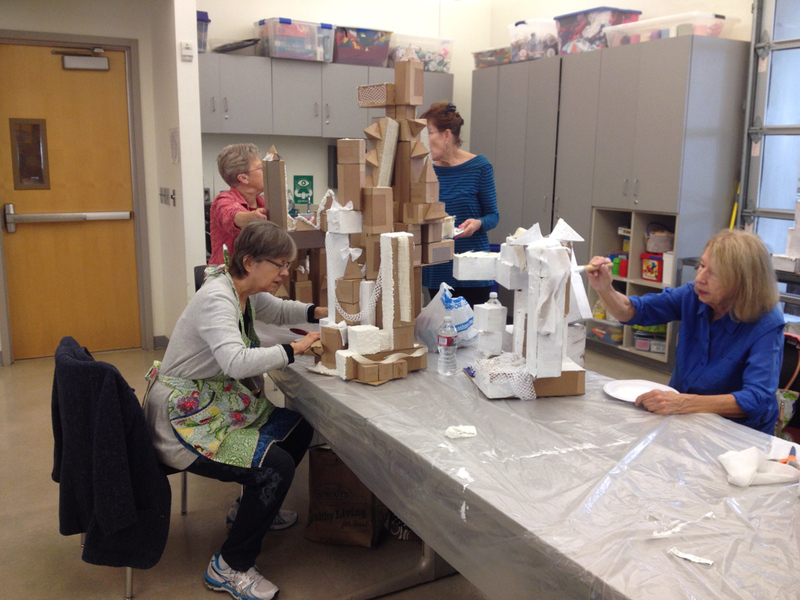 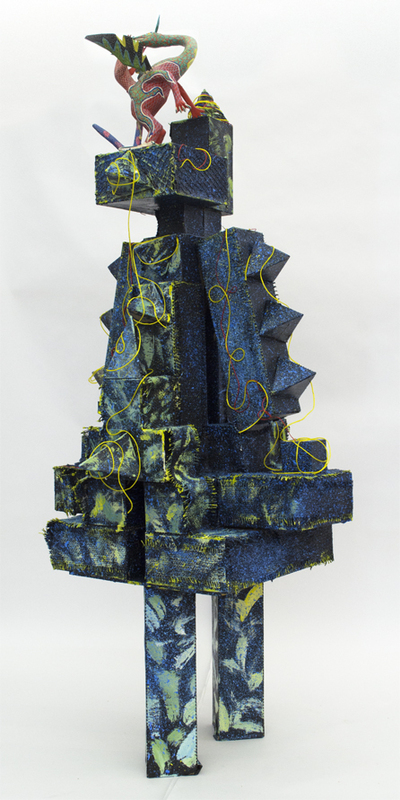 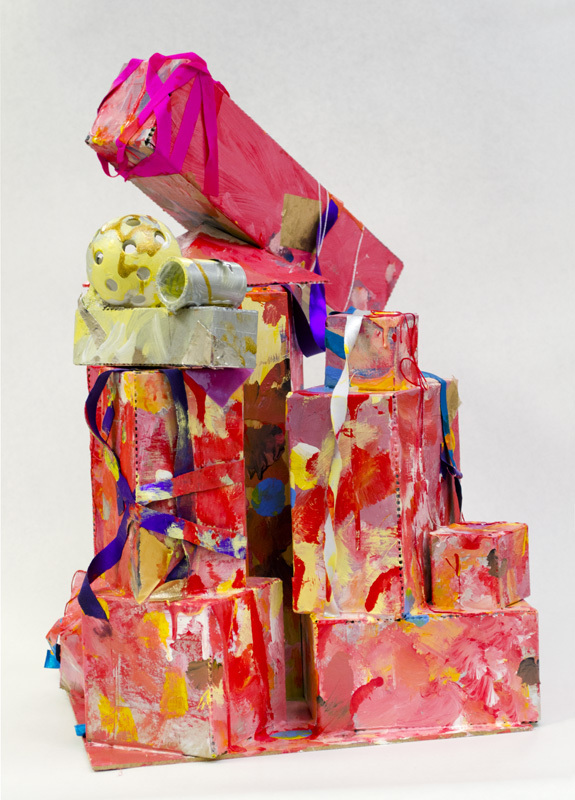 In the first two participants build a sculptural pedestal for an object of personal significance or for a smaller scale sculpture; in the third, groups work collaboratively to make a large-scale sculptural pedestal to hold a smaller arrangement of blocks, closer to a still life, to display on their group’s larger sculptural pedestal.